Backup Offers Only Listing – Call Pia Soper at 661 645 5556 to see what else may be coming available! Check out this New Listing at 26916 Monterey Avenue, Valencia 91355 as of 02/24/2014 in the Valencia CA real estate area of Santa Clarita homes for sale. This great home is located in the popular Valencia Meadows tract in Valencia 1 neighborhood and has 3 bedrooms and 3 baths and 1945 square feet. This home is located off Valencia Blvd. Close to Santa Clarita & Valencia paseos and hiking trails. Great schools. See more below. 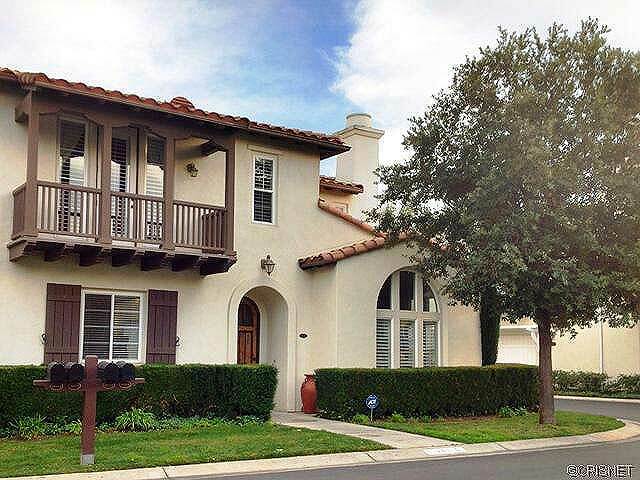 Beautiful corner home in the prestigious guard gated Woodlands community. This 3 bedroom 2-1/2 bath Carmelita home boasts dark hardwood floors, built-ins and a great floor plan . Entertaining is easy in this kitchen: granite countertops with full back splash gives you plenty of workroom, your eat-in kitchen and island allow plenty of room for guests. Enjoying a movie in your family room is even better with your built-in media center and fireplace. Master Suite has walk-in closet in the bathroom and French doors that take you to your private balcony. Secondary bedrooms share a Jack & Jill bathroom. Working from home is convenient in your office niche with built-in desk. This guard gated community has it all: Pool, spa, club house, playground, tennis courts and basketball courts. Not to mention, your front landscape is maintained by the HOA. This Valencia CA home for sale at 26916 Monterey Avenue, Valencia 91355 is located off Valencia Blvd. with great access to the Golden State Freeway. This is a standard sale. Schools for this home are West Ranch High School and Rancho Pico Junior High School and Bridgeport Elementary school. All excellent schools and one of the reasons many new home owners with children find reason to purchase in the Valencia Woodlands tract.